Robyn Garnier is the corps director for the Community Living Hamilton Drum Corps, a most special and unique group. The following is her story in her own words. I marched 10 years in the Burlington TeenTour Band as a guard member and guard captain, spent one year as a snare and pit performer for Ventures, DCI Class A Champions, one year on quads in St. Andrews senior corps and one year on quads in Royalaires. I have worked for the Hamilton Association for Community Living for 17 years as a member of the front line staff. 2003 was the 50th anniversary for the association and I wanted to do something to commemorate this event that would involve a lot of the clients. I was also missing marching terribly. So, with wonderful support from our executive director Bryan Shields, the Community Living Hamilton Drum Corps was started. All of our members have a developmental disability, and some also have a physical disability. The logo on our banner says "first of its kind." Well, not only are we the first, but we are--to the best of our knowledge--the only one in the world. That sums it up nicely. In 2003, we did three performances; the Hamilton Association for Community Living 50th anniversary, the Burlington Sound of Music festival and the Hamilton Santa Claus parade. The corps consisted of a banner, honor guard, flag line and a drum line of six that was made up entirely of staff. 2004 brought a name change to the association and we were renamed Community Living Hamilton. The other thing that happened was that my original vision for the corps was to have a corps consisting of 90 percent clients and 10 percent staff. Clients were added to the drum line and the staff supported the flag line. We performed at some in house functions, the Sound of Music Festival and the Hamilton Santa Claus parade. 2005 was a phenomenal year for the corps. We did the same two parades (including a standstill performance at the Sound of Music festival) and the Dundas Cactus Festival parade. We added a spinning flag line, a flag line of small hand-held flags (for those who were new) and more drummers. The corps is full at 50 members. We play all original music (written and taught by myself) and I also teach all choreography. All the participating staff members are volunteers. 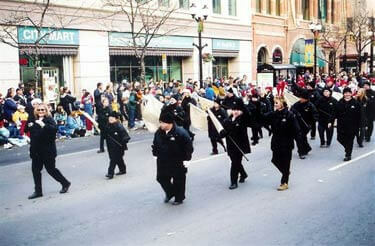 Our repertoire for 2005 was street beat, flag beat, "Ontario, Colonel Bogey March," bass beat and "Jingle Bells." For 2006, we will be marching 50 members again, but I have removed the spinning flag line and the small flag line. We will be marching a banner, honor guard, one flag line (everyone doing the same routines) and a drum line composed of five bass drums, two quads, three snares, four first line tenors and two second line tenors. In case you're not familiar with that terminology, it's simply based on the degree of difficulty of music played. We also have two glockenspiels. Big things are in the works for this year. We've been invited once again to the Sound of Music Festival, we will be performing at several in-house functions and the Dundas Cactus Festival parade and Hamilton Santa Claus parade. I am also hoping to be invited to the new Waterloo Band Festival. Our repertoire for 2006 is essentially the same as 2005 with the addition of a quad beat and "Happy Days are Here Again." We were hoping to add a horn line this year, but I don't see it happening. HYPE, a junior corps from Hamilton, kindly lent us some old two-valve horns as they got new ones. They don't seem to stay in tune, but we do appreciate the fact that services were offered to teach us and the equipment was lent. In 2005, the Lakeshore Brassmen Senior Corps from Port Dover contacted us to say that they had unfortunately folded in 2003 but had some things in storage that they would like to donate to us. Unbelievably, they donated drums, flags and miscellaneous things. Through their generosity, it enabled me to be able to expand the drum line and offer that opportunity to more clients. The corps is becoming more in demand as more people hear about us. I've had interest expressed from Special Olympics regarding performing at some of their events. The corps is mostly made up of adults (ages 24 to 70). Corps members have changed their lives in a way that I don't think they have quite realized. They have gained confidence, carry themselves with tremendous pride, view themselves as contributors to society and "not different" and have themselves become educators, as they help each other learn music and routines. They also enjoy self-promotion and will tell anyone about the corps and their part in it. You really have to know the members to appreciate the impact the corps has made. As an agency we are well known to the community. The corps is a very small part of Community Living Hamilton. Not a lot of people outside local corps and bands know about us as we don't travel far, have never been to a corps show and have not been around very long. However, we get tremendous response from people who see us in performances, and although they don't pan out, we do get a lot of interest from people wanting to help. Usually they happen to hear us and walk by during practice. That being said, we have a casino night once a year to create operating funds for the corps and to pay back the loan that occurred to start the drum corps (for shirts, coats and equipment). The community is very gracious with various donations for that evening. There was wonderful interest when we first started and as in all corps, it became a family. The best thing about our members is seeing their faces after a performance and the pride they feel because they are doing something the same as everyone else. Ours is not a pity corps and the members work extremely hard at becoming a crowd favorite. The corps has given the members new experiences. A lot haven't been on a bus before, haven't been to a parade before and none have been to a corps show, (which is why I really hope we get invited to the Waterloo Band Festival). The corps philosophy is inclusion, life experience and fun. We practice two hours a week and astound people with our sound. The drummers are beginning to read music and as I've already mentioned, the members without fully realizing it are becoming educators as they are helping each other. I think it is very rare to have corps members just as enthused over a practice as they are over a performance. They just love to entertain others.